The River Hills Motel is located on Hwy 42N only 5 blocks from downtown and Lake Michigan. We also have 8 boat slips on the Ahnapee River available for our customers to rent daily. Contact: Carol & Don Linse, owner/operators. The River Hills Motel is located in Algoma on the north edge of town (right off Hwy 42N), just past the China Moon Restaurant and Algoma Car Wash. We are only 5 blocks from downtown and the lake. The Ahnapee River is right across the road from the motel and we have 8 boat slips that customers can rent on a daily basis. 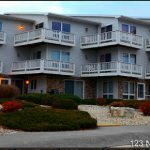 Amenities include: air conditioning/heat, refrigerators/microwave, In-room coffee, wireless internet, Cable TV, full bath, and freezers by each building for your fish. We have 4 pet-friendly rooms for an additional fee. Ample parking for boats & trailers. You are welcome to bring a grill to cook outside. The public boat launch is 5 blocks away and has an excellent fish cleaning facility.